The America’s Cup event was over hyped. Many held unrealistic expectations of how it would do. However, hype shouldn’t be the benchmark. What we should be considering to determine whether or not the America’s Cup event was a success was comparing it to the original estimates. Those were the basis upon which the decision was made the host the event and should be the benchmark as to whether or not the event was a success. Smart financial decisions are not based upon hype. They are based upon conservative projections of a return on investment. America’s Cup was not brought here because of hype, it was brought here because conservative projections suggested it was a good investment. What we really need to do is take a step back and compare the results that we’re seeing against the projections to prove if the investment was worth it. The conservative projections suggested that based upon the invested amount we would generate $235 million of direct spend on the island. We need to figure out if the returns generated met or exceeded that estimate. If you expected it to bring the second coming of Jesus then I can only shake my head that you bought into such hype and suggest you’re reading the wrong blog. The America’s Cup was a well planned event. It was the only case I’m aware of where an estimated potential economic impact assessment was done to justify whether or not the event should be done. These sorts of things are critical. It is easy to throw money at something and hope, but that doesn’t always yield results. It is much better to take a measured approach to develop a plan and estimate conservatively as best you can so you have a good idea of expectations. 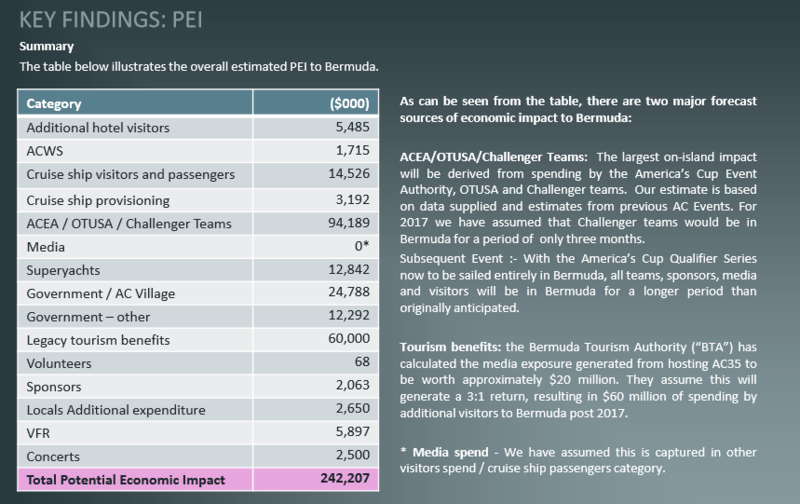 Here were the key findings of the potential economic impact assessment report. 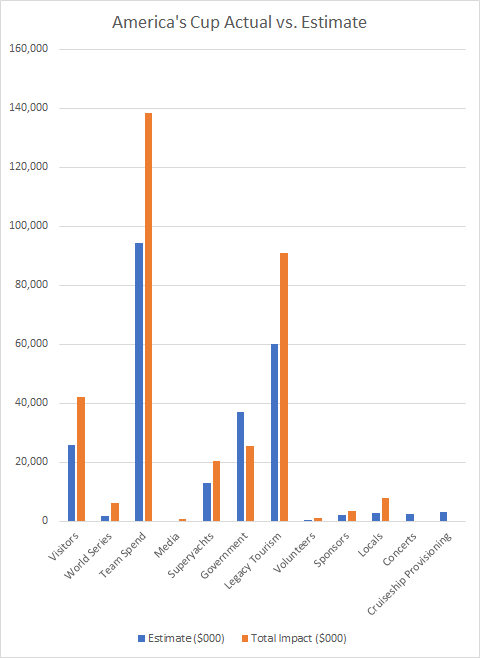 The categories didn’t match exactly as there were some variations in terms of estimates for more cruise visitors, increased impact on government and concerts. Visitors was given as a total which has been compared against the $25.9 million total estimate for visitors. There was no impact from cruise provisioning, government-other or concerts. 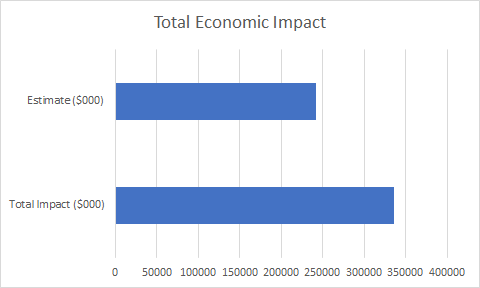 Overall however, every category outperformed the estimate of gdp impact with the exception of government. How did the actual event measure up? In total expenditure, the impact was reported as having been $336.4 million vs. the original $242.2 million. Was the America’s Cup a success? There has been a great deal of debate about whether it could have done more or shared the benefits better. However, when considering whether the event was planned, estimated and executed successfully, the numbers suggest that it exceeded expectations. Let us hope that future events and initiatives are planned, estimated and executed in a similar fashion while yielding a similar level of success.